It’s not all sparkles, party-time and un-ending barrels of Dorwinion wine in the underground halls of Thranduil’s stronghold. In fact, if one delves a little into Unfinished Tales a number emerge why one should consider Thranduil quite a formidable ruler, especially in relation to some of his elven peers. Here are four of mine (you may have more). Consider this: the Silvan/Sindarin kingdom of Oropher and Thranduil has out-endured every other Middle-earth realm except the Grey Havens on the ocean side of the Blue Mountains, and, probably, Lorien. The Tale of Years gives Second Age 1 as the date of the founding of the Havens. It is not known for certain when Oropher and Thranduil travelled eastward to Greenwood the Great (later renamed Mirkwood) out of the ruin of the realms of Beleriand. However, the Tale of Years indicates it occurred before Sauron built Barad-dur, which was completed sometime around S.A. 1000. …came from Doriath after its ruin and had no desire to leave Middle-earth, nor to be merged with the other Sindar of Beleriand, dominated by the Noldorin Exiles for whom the folk of Doriath had no great love. Unfinished Tales, The Sindarin Princes of the Silvan Elves. 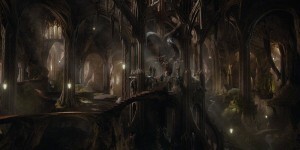 In any case, Oropher brought together the scattered Silvan elves of the Greenwood under his leadership, establishing the kingdom that Bilbo is a “guest” of more than 5,400 years later. Lest you think this is all great PR for Oropher, Thranduil is boss for a good 3,400 of those years. In that time he had to contend with the rise of The Necromancer on his southern borders, and at least one dragon lurking not far to the north. In the meantime, Arnor and its successor states had come and gone, Erebor and Dale likewise, and Eregion had both risen high, and fallen into dust. Khazad-dûm had long been abandoned to Durin’s Bane, and the twin dwarf cities of Nogrod and Belegost were but a memory. Unfortunately, Oropher may have too obstinate about remaining separate from the Noldrin influence. It proves his and his people’s undoing during the War of the Last Alliance. …they were independent, and not disposed to place themselves under the supreme command of Gil-galad. Their losses were thus more grievous than they need have been, even in that terrible war… Oropher was slain in the first assault upon Mordor, rushing forward at the head of his most doughty warriors before Gil-galad had given the signal for the advance. Who’s left to salvage the remnant of Oropher’s forces and ensure they don’t all get turned into orcburgers? 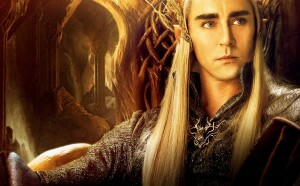 Thranduil. 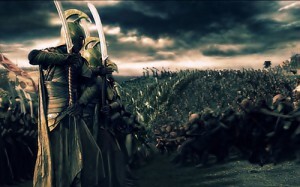 The losses of the Sindarin elves are still very heavy — if only because they are more lightly armed and armoured than the Noldor — but they survive in enough numbers that a large force of orcs that later ambushes Isildur near the Gladden Fields allows them to pass unmolested.